Bring brown sugar, butter, stock, water and salt to a simmer in a heavy bottom saute pan. Stir until the sugar is dissolved. Add the baby carrots and coat the carrots with the sugar mixture. Cover and simmer for 6-7 minutes until the carrots are soft. 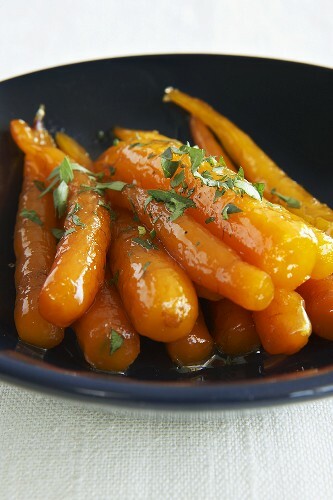 Remove the carrots with a slotted spoon and set aside. Continue to reduce the sugar mixture until it is thick and glaze-like. Add the carrots back to the glaze and coat fully. Remove from the heat, stir in lemon juice and garnish with parsley. These can be made a day ahead and then reheated before serving. Kale is king when it comes to nutritional value. 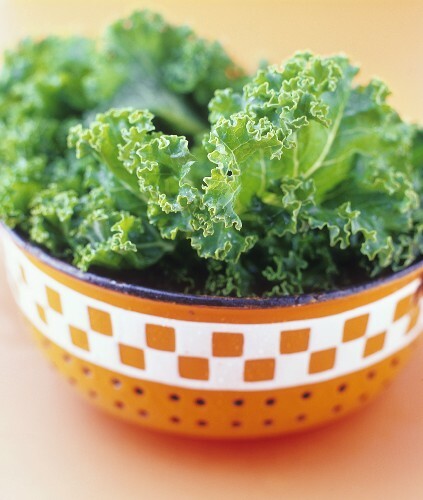 There are very few vegetable out there that pack the same vitamin punch as this leafy green. Surprisingly, it also tastes delicious. 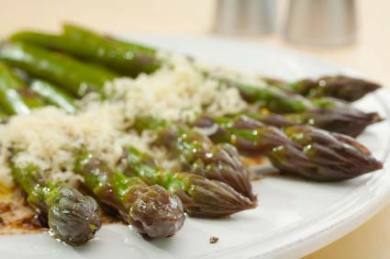 It pairs wonderfully with garlic and is a great alternative to the more typical sauteed spinach. Using a knife, cut the leafy green part of the kale away from the course center vein and stem. Rip the leaves into 2-3 inch pieces. Wash well and set on paper towels to dry. Do not dry totally. Add more oil if necessary and once the oil is hot again, add the kale. Use a wooden spatula to push the kale around until it begins to wilt and then add more. You will want to add all the kale. Once it has begun to wilt, season with salt and pepper and red pepper. Cook until all the leaves are completely wilted. Add the garlic back to the kale and mix well. Serve warm. I love the mustard flavor that comes through in this version of mashed potatoes. It’s an added surprise in a very well known dish. The flavors also really blend wonderfully with the short ribs. I adapted this recipe from Ina Garten, she suggests serving it with classic British bangers. Also a great way to eat these delish potatoes! Put potatoes in a large saucepan with 2 tablespoons of salt and enough water to cover the potatoes. Cover and bring to a boil. Reduce to a simmer and cook for 25 minutes until the potatoes are fork tender. Drain potatoes and return to the saucepan off the heat. 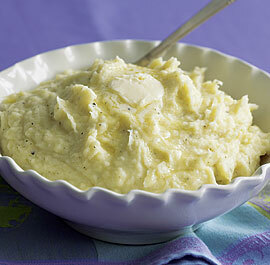 If you have a potato ricer, use it to mash the potatoes then mix in the remaining ingredients. If not, add the butter, milk, creme fraiche, mustards, pepper and use a hand held mixer to mash the potatoes. Add at little extra milk if the potatoes still seem stiff and thick. Taste and adjust seasoning as needed. Feel free to add a bit more Dijon and whole grain mustard if you want a stronger mustard flavor.